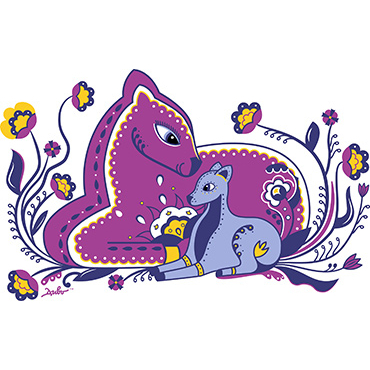 Print "The baby deer with mom"
Deer is a symbol of something auspicious, associated with the sun, sunrise, light. The image of a deer in all cultures is believed to be majestic and graceful, clean and bright, fast, beautiful. The deer is connected to the Tree of Life. In addition, its antlers symbolize sun and fertility. So this beautiful print is perfect for both loving mothers and for their wonderful children. It symbolizes unbreakable and unshakable connection of mother and child and will bear this strong love through the years. This print will perfectly complement any style with a touch of love coming from it. Loving deer is looking at her little baby-deer with love and care and will do anything for her child. The Little deer knows: its mother loves it sincerely and selflessly, so it should show its respect, love and gratitude to the mom. Our print will always hold light and warmth in your heart and your soul. Each mother will remember the first words, smiles, first steps of her child, and the child will always remember to say words of love and appreciation. Bright flowers and beautiful deers are your blessing for a happy family. 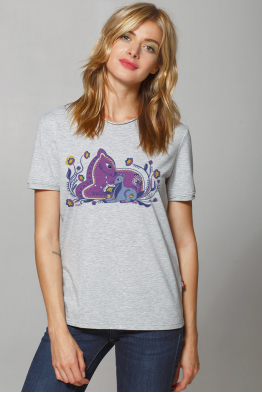 Women’s T-Shirt "The Baby deer with its mother"
The nicest word in the world is “mother”. The most beautiful woman on earth is mother. So we c..